The sight of a little warbler feeding an enormous cuckoo chick has astonished observers since ancient times. It was once thought that cuckoos were unable to raise their own young because of defective anatomy and behaviour, and so other birds were only too delighted to help them. This quaint view was overturned by Darwin, who suggested that the cuckoos’ parasitic habits were advantageous and that their host species were tricked. 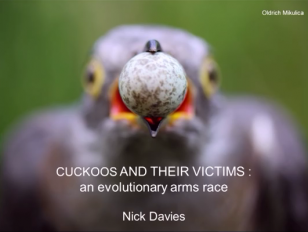 In this lecture discover how field experiments and genetic studies reveal an ongoing evolutionary arms race, in which escalating host defences have selected for remarkable cuckoo trickery. Come and be amazed by different guises in female cuckoos, beautiful forgeries of host-egg signatures, and manipulative begging by cuckoo chicks. This is a fascinating corner of Darwin’s “entangled bank”, where organisms are forever evolving to keep up with changes in their rivals. Mammalian biodiversity: past, present, future?